Tireless is probably a more than apt description of our host this month. Since I have joined the Daring Bakers, I've looked forward each month to Audax Artifex's take on our challenges, his lightening fast completion times, and the phenomenally articulate recipe notes that he shares nearly immediately. For his hosting of a challenge, I would have expected something wildly complex, but instead he chose biscuits (called scones in Australia), and he really mastered them. Go have a look! I started my testing of biscuits near the beginning of the month, and only did 6 batches, 10 short of Audax's 16. I fully intended on making his recipe at least once, but I got so sidetracked by sourdough that I never made it that far. In fact, I did my last full dessert biscuit application yesterday, not leaving myself any time to get to his original recipe. Maybe I was just so inspired by Audax's tireless approach to mastering a recipe that I figured I'd adapt a single recipe until I had it nearly foolproof myself. this batch didn't rise so high because I patted the dough thinner, about 1/2 inch. I have made baking powder biscuits in the past. I know that you are supposed to be careful with the dough, not to beat it up, treat it with a lick and a promise and make sure that they touch each other when you pack them lightly onto a baking sheet. I have never made sourdough biscuits however, which I have to assume are the predecessor to the more modern baking powder version. The base recipe I found tasted so good on the first go (except that I used butter right out of the box... I would not be found messing around with butter flavored vegetable oil), that I varied my fats, baking temperature and roll-out method and found my favorite combination fairly quickly in only 6 batches. The base recipe (by Phil Mahan) I used was designed for a camp cooking experince. It is extraordinarily simple, and it's very easy to make half batches of which is good when you can polish off a whole batch warm from the oven. I found it best to use sourdough starter (100% hydration) that I had fed about 4 hours prior. I also tried adding baking powder along with the natural leaven of the sourdough, and found no real discernible taste difference. The rise took about half as long, which was maybe convenient, but my personal feeling is to let the biscuit be naturally leavened. I think I am just still intrigued that the jar on my counter can lift dough, and if given the time, it does a stellar job of it. In my first trials, I mixed room temperature soft butter with sourdough starter, added my flour/salt/sugar mixture and basically "kneaded" it in a large bowl by folding it over onto itself until it formed a ball. I tried to do this purposefully, so I wouldn't beat up the dough, but with a sturdy hand so that the dough would come together somewhat swiftly. Then, I simply patted the dough out into a rough block about 1 inch thick. (I also tried patting it thinner, and they didn't rise as high.) 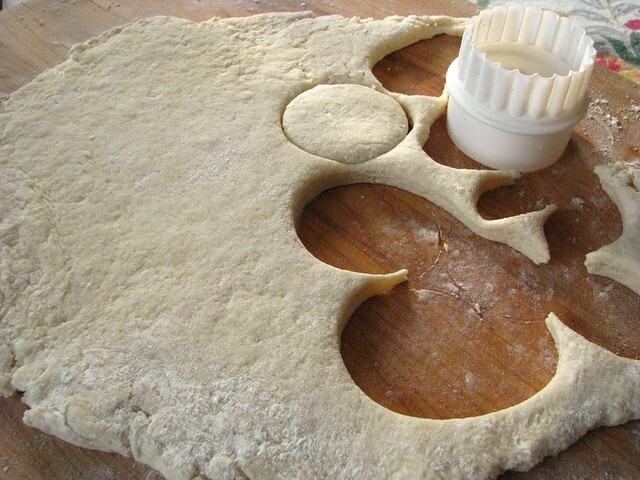 Using a round cutter, I used the classic method of pressing straight through the dough and then twisting to cut out the biscuit. I gently pressed my scraps together, and even though they were not quite as pretty and didn't rise quite as high, they still tasted great - lightly sweet and still a little sourdoughy. They are a perfect match for sweet or savory, I don't think I'd change a thing to turn them into strawberry shortcake or drown them in gravy. The original recipe I used for sourdough biscuits didn't call for traditional biscuit cutting, it called for forming the dough into balls. Not only is this faster, I found that they rose better too. After forming a batch of biscuit balls, I decided that something could easily make its way into the middles of round biscuits and stay put. The month wasn't long enough to try all of the ideas that popped into my head. The first combination I tried was ham and a slow melting "baked" cheese called Juusto. I love this cheese, and it's actually made just down the road from my Parents. Not knowing if the biscuit balls would pop open on me, I was a little stingy with filling them. I remedied that yesterday when I decided on making a chocolate and tart cherry version. I packed them with as much filling as they could hold, pinched the dough firmly to keep it in place, then rolled it lightly between my palms. This was the first jar of tart cherries I opened from last Summer. I got 27 lbs. 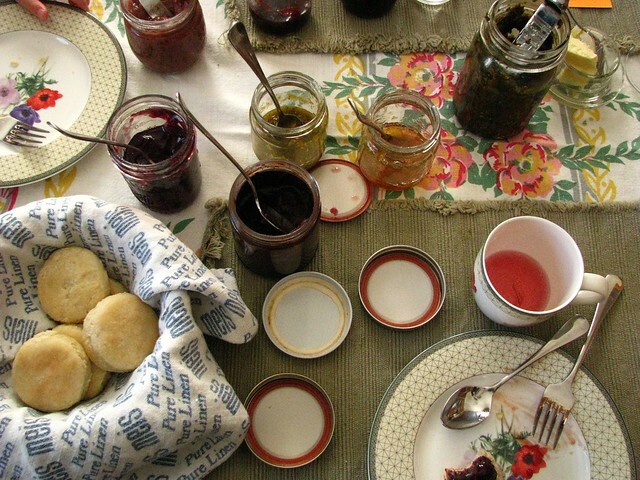 of already pitted fruit from Cherryland's Best with a group of area food bloggers. 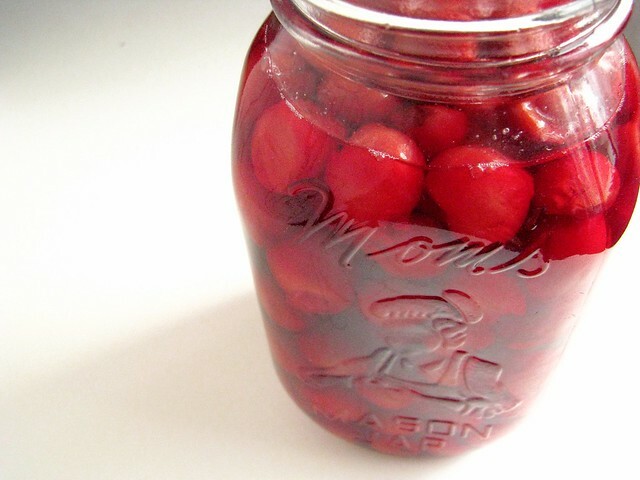 I canned my whole cherries in an light syrup (1 part sugar to 4 parts water), and they tasted so good when I popped a few into my mouth, as good as they did the day I got them, reminding me exactly why canning appeals to me so much. 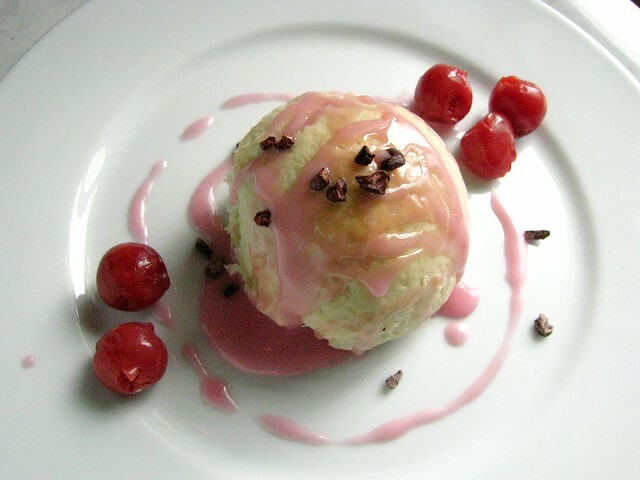 While the mixture of wrung-dry cherry and chopped chocolate doesn't look the prettiest, it makes up for it in flavor. The cherries are undeniably good, but I have to believe that part of the reason is also that I was gifted a block of Callebaut bittersweet baking chocolate. That chocolate gift was better than if someone gave me a piece of Stueben, though I treat it the same way by often admiring it's heft and smoothness. I do this for a positively certifiable amount of time. I then mixed a little cherry syrup with powdered sugar to make a pale pink glaze, and I could feel the pangs of sugar guilt running through my veins. I ended up eating 2 of them, hot out of the oven, glazed and sprinkled with cacao nibs. I didn't feel guilty at all. Well, maybe I did just a little. 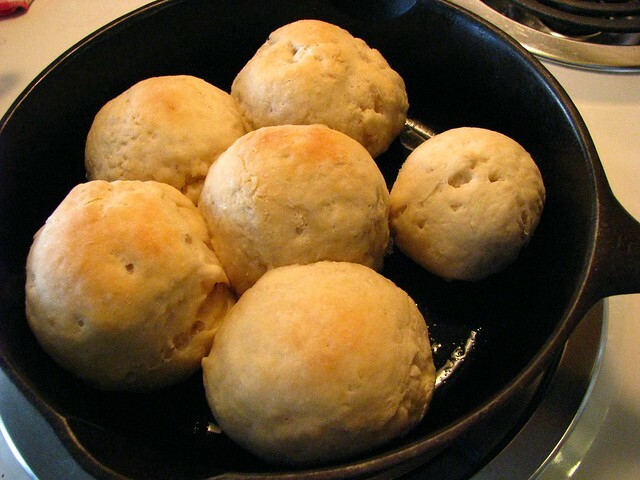 I would venture to say that sourdough biscuits do taste best the second they come out of the oven, even though the unfilled biscuits I made were very good when toasted the next day. There are few things better than devouring something right after it comes from the oven, so I'd encourage you to plan it that way. When using well fed starter, I found 2 hours of rising time to be plenty. I also find it hard to get good color on these, even when I baked them longer they still barely blushed golden. It doesn't affect the eating though. Remember the recipe is easily cut in half. Stir to combine flour, sugar and salt in a medium sized bowl. Butter a cast iron skillet large enough to fit your batch (a 5 or an 8 worked for me for half and whole batches respectively). 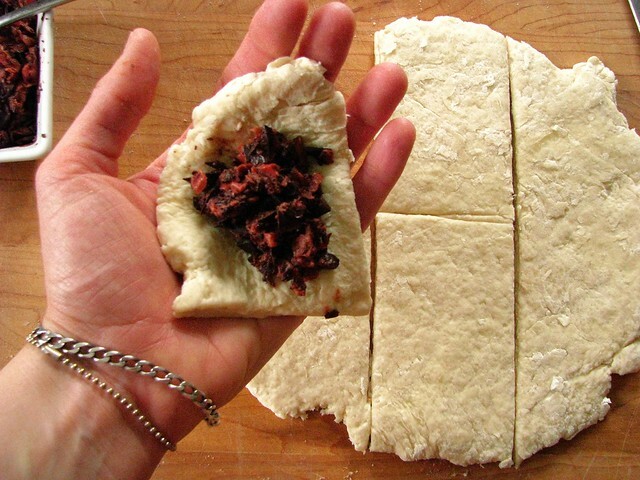 Press the dough out to a uniform thickness, about 1/2 inch (aim for 1 inch if you are going to cut biscuits using the method described above). Cut into 6 pieces. 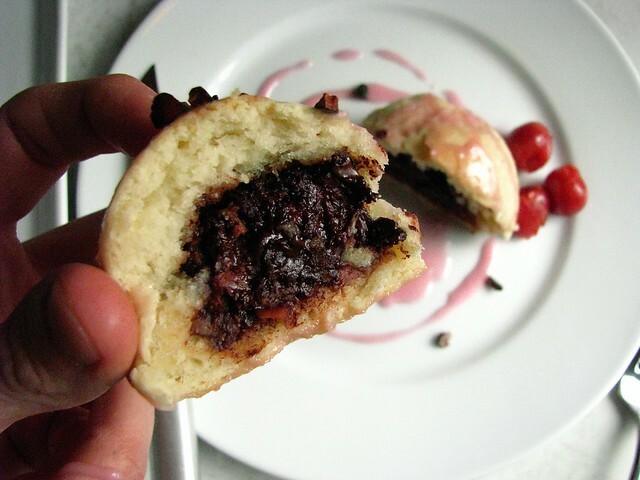 Working with one piece at a time, put a good amount of tart cherry and chocolate filling (recipe below) in the center of the dough and fold up the dough around it. 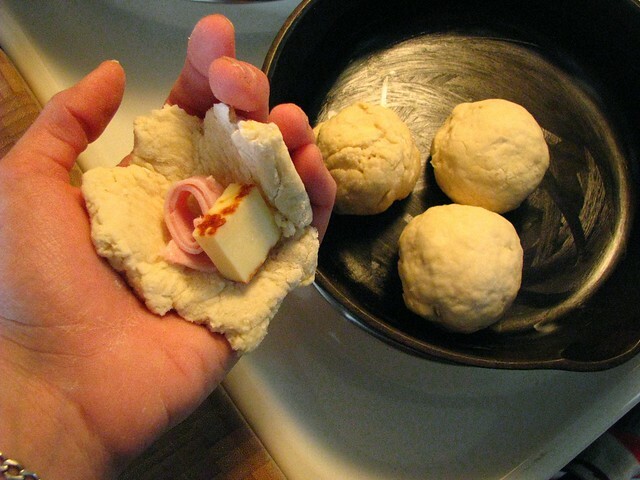 Pinch it tightly to completely enclose the filling, then gently roll the dough to form a ball. 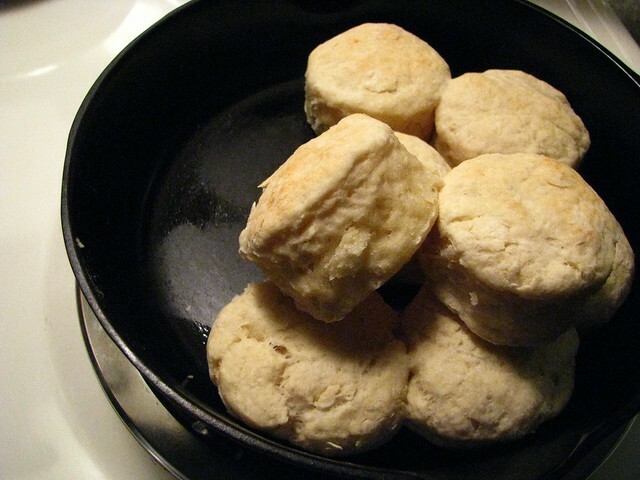 Place the biscuits, just barely touching each other, in the prepared skillet. Let rise (covered with a towel) until nearly doubled in bulk, about 2 hours depending on the warmth of the room. Towards the end of the rise, preheat the oven to 375. So, I'm just days away now from my month free of sugar - or really it was my month almost free of sugar. What little splurging I did do was definitely worth it. My goal of feeling committed to less sugar on a daily basis is going to stick I think. I have gotten out of the daily routine of dessert, which some may argue is heresy, but I feel great so I'll continue it. At least until my next Daring Baker Challenge. Thanks again to Audax for his amazing effort and choice in a challenge this month. I promise I will try his non-sourdough biscuits, but I am so happy that I got obsessed with this version! I would never have considered sourdough biscuits, and now they are just another of the sourdough things that I can't live without. If you're coming to dinner and I forgot to plan a bread, you're getting sourdough biscuits, and you are going to love them.